Cleveland Browns tight end David Njoku turns upfield after making a catch during Monday's practice at team headquarters in Berea. The Cleveland Browns' coaching staff will continue to trust second-year tight end David Njoku despite inconsistent play throughout training camp, the preseason and the 2018 regular-season opener. 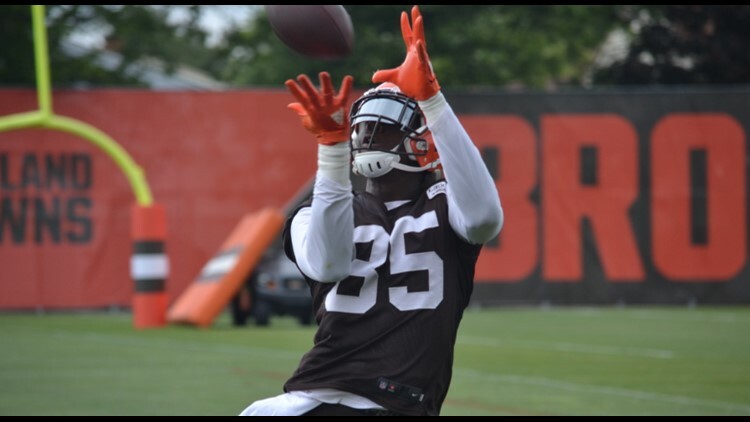 CLEVELAND -- Second-year Cleveland Browns tight end David Njoku has no shortage of physical gifts, but when it comes to consistently catching the football, that has been a work in progress since he was taken in the first round of the 2017 NFL Draft out of the University of Miami. Njoku was plagued by drops and caught just three of the seven passes thrown to him in the Browns’ season-opening 21-21 tie with the Pittsburgh Steelers at FirstEnergy Stadium in Cleveland last Sunday, but he still has the trust of the coaching staff because they have seen him rebound from tough outings and training camps in the past. “The players trust us to put them into positions to succeed,” offensive coordinator Todd Haley said. “We have to trust them. That is what we practice for. There are going to be drops in the game. I coached receivers for a long time. I know that. Those are the types that we do not want in critical situations, especially the third-down ball. Cleveland Browns tight end David Njoku looks a pass into his hands in a drill during Organized Team Activities practice at team headquarters in Berea. 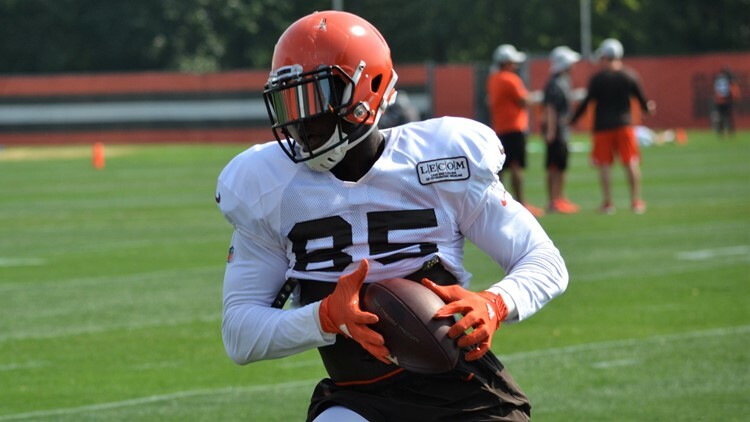 Njoku began his second training camp much like his first, with plenty of frustrations over his troubles consistently hanging onto the football, and to combat those issues, spent extra time after practice working with quarterback Tyrod Taylor, Haley and wide receiver Rashard Higgins. And while Njoku struggled his way through the first two weeks of training camp, just as he did a season ago, there was plenty of productivity in the Browns’ 20-10 victory over the New York Giants in the 2018 preseason opener at MetLife Stadium in East Rutherford, New Jersey. Njoku caught a 16-yard throw from Taylor at the 20-yard line, and then, outhustled Giants defenders down the field before diving across the goal line for the score, which gave the Browns a 7-3 lead over the Giants with 2:55 to play in the first quarter. 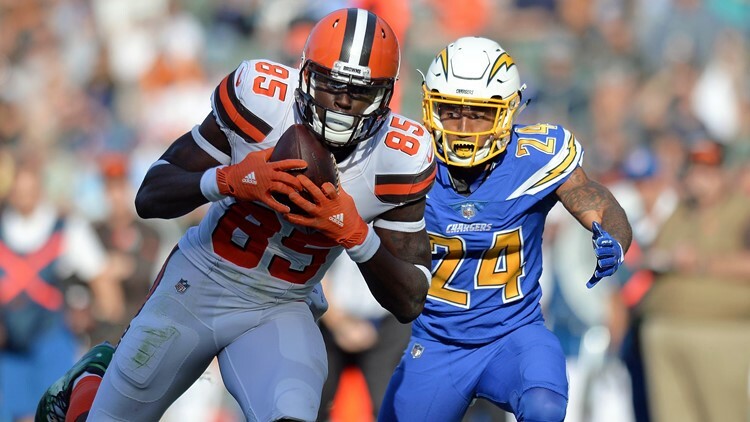 Cleveland Browns tight end David Njoku (85) is defended by Los Angeles Chargers cornerback Trevor Williams (24) as he catches a second-quarter touchdown at StubHub Center in Carson, California. Njoku was far from done leaving his mark on the preseason opener. With the Browns facing a second-and-goal from the Giants’ 10-yard line, first-year quarterback Baker Mayfield fired a pass to the back of the end zone, where despite heavy coverage from New York’s secondary, Njoku pulled in the touchdown reception. Njoku’s second receiving touchdown of the game gave the Browns a 13-3 lead over the Giants with 6:43 to play in the first half. “I think the quarterback goes and has a personal conversation with the player because he needs him,” Browns coach Hue Jackson said. “He is throwing it to you because you are open or that is part of your progression, so you’ve got to make those plays for him.